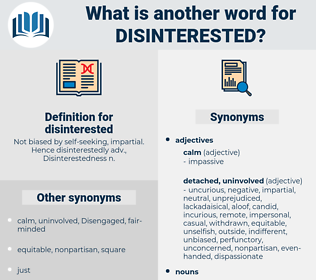 What is another word for disinterested? Not biased by self-seeking, impartial. Hence disinterestedly adv., Disinterestedness n.
selfless, unselfish, indifferent, impartial, neutral, even-handed, unbiased. concerned, feeling, interested, biased, involved, subjective, passionate, prejudiced, partial. covetous, unjust, fervent, penurious, colored, conscientious, stingy, illiberal, distorted, deceitful, greedy, keen, niggardly, rapacious, sensitive, dishonest, close, warm, petty, mindful, unreasonable, parsimonious, mean, deceptive, ignoble, avaricious, unsympathetic, unfriendly, inequitable, heedful, warmhearted, aware, Ex parte, caring, miserly, zealous, warped, one-sided, jaundiced, unconscionable, nonobjective. One feels as if he wanted to squeeze or shake Emerson to see if he cannot get some normal human love out of him, a love that looks for nothing beyond love, a love which is its own excuse for being, a love that is not a bargain - simple, common, disinterested human love. Against this mad intrigue one clear - headed individual resolutely set himself - not wholly from disinterested motives.